Sturdy construction, one table and comes complete with four stools. 100kg max stool weight capacity and 30kg max table weight capacity. It can be folded to a flat, space saving, easy to store. A necessary addition for enjoying your outdoor life. 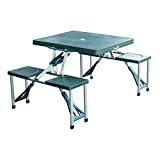 •This stylish portable table is perfect for outdoor camping, picnic, study, playing games etc. It also suit for market, stall, fair, tradeshow use. •Sturdy construction, one table and comes complete with four stools. •100kg max stool weight capacity and 30kg max table weight capacity. •It can be folded to a flat, space saving, easy to store. •Comes with a carry handle for easy transport. •A necessary addition for enjoying your outdoor life. •There is an umbrella hole in the middle.